Thank you to everyone who attended the Reception for the Scottish Older People's Assembly on the 5th March. It was an enjoyable evening, with some fantastic contributions from our speakers, interesting stalls and a chance to network with many organisations that are working with older people across Scotland. 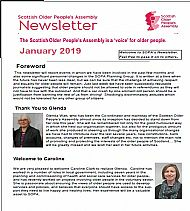 Thank you to our host Christine Grahame MSP who provided a warm welcome, and to the Minister for Older People and Equalities, Christina McKelvie MSP who spoke about how older people have been engaged as part of the development of the forthcoming Older People's Framework. We also heard from Cllr Jimmy Miller and Cllr Elaine Thornton-Nicol, Older People's Champions for North Ayrshire and Scottish Borders Councils respectively. 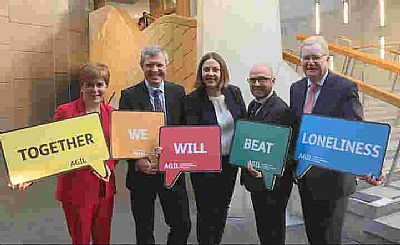 They gave an interesting insight into their role and called on all Local Authorities to support an Older People's Champion role to ensure that older people are considered in all decisions taken. 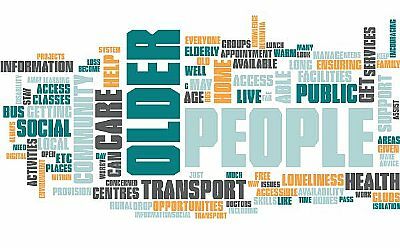 Last October, SOPA was invited by the Scottish Government, as a member of the Older People Strategic Action Forum (OPSAF), to undertake consultation to feed into the development of a National Framework for Older People. 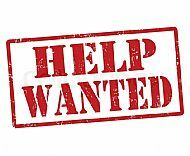 19 February 2019Web Volunteer Wanted - Can You help? 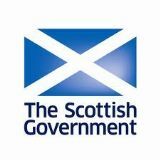 The Scottish Older People’s Assembly (SOPA) is looking for a volunteer to help them review and revamp their website. Do you have the time, skills and interest to help? Find out more about the role. 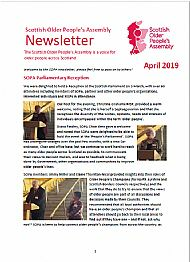 Read the latest SOPA newsletter here.